What’s your unicorn, someone asked. The answer is, a really nice screenshot tool, so that I can do my software reviews with speed, elegance, delight, and, most of all, efficiency. With roughly 5,000 screenshots manually created every year, excluding the automated in-game stuff and whatnot, I am in a dire need of a program that will allow me to waste as little time on image processing as possible. So far, I haven’t really found a perfect match. 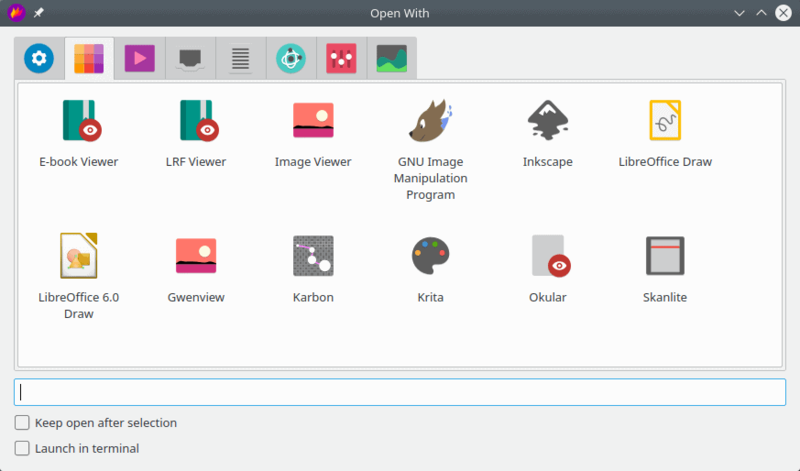 I complained about this in my KDE apps review article. Most programs have some decent and redeeming features, but they all miss a crucial something. In theory, Plasma’s Spectacle COULD be the tool, except it forces shadows onto images, so if you want clean screenshots without massive alpha channel, you need to manually waste time cropping and cleaning. Hence, my choice at the moment is a much simpler Gnome screenshot. But is there a superior alternative? Well, according to rumors and comments, Flameshot ought to be bee’s knees. Tested, I have. 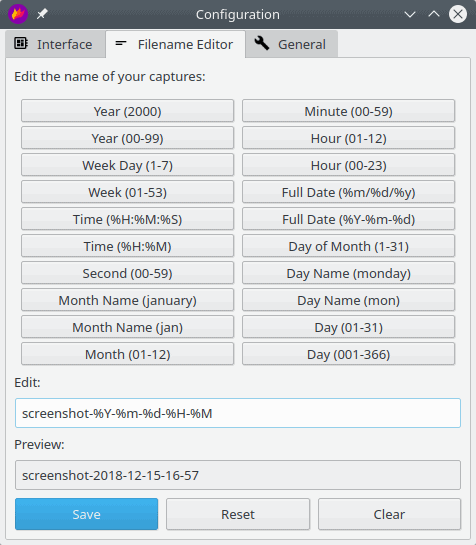 Flameshot is a combined screenshot grabber and lightweight screenshot editor program, fused into a single tool. You’re supposed to capture whatever interests you, and then apply any additional tweaks to the image, like annotations, arrows and such. This is meant to save time, and allow you to get all your needs from one piece of software. A noble end, but does it hit the bull’s eye? 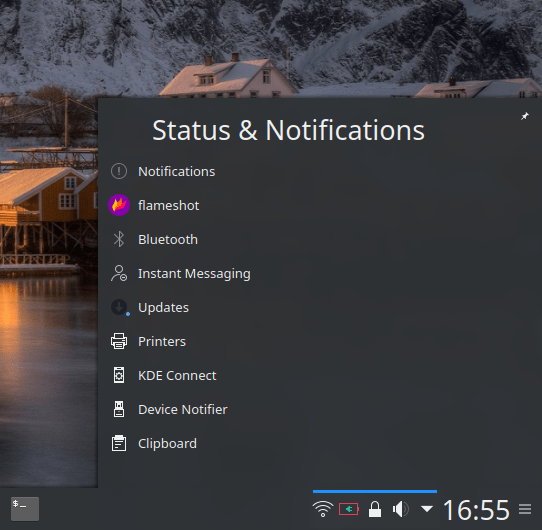 I tested Flameshot in Kubuntu 18.04. The program is available in the repos, so grab it, install it, then run it. My first snag; I selected Launch Flameshot from the menu – and nothing happened. I thought the program was busted, so I tried from the command line. Nothing. 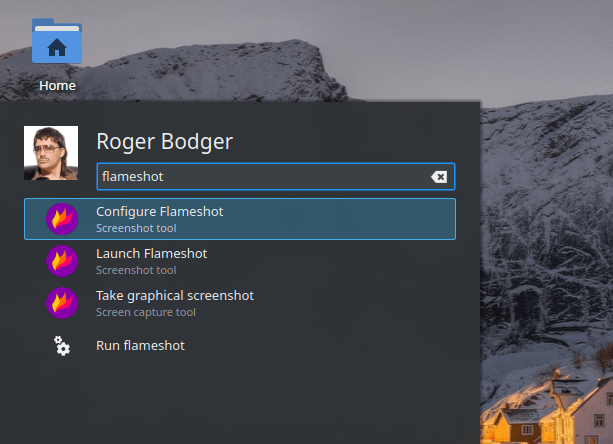 But the configuration tool did launch, and only then did I realize that launching Flameshot doesn’t really open a UI, but instead you get a system tray icon that you can then use to invoke screenshot captures. Very not intuitive. Why not have a simple interface like any other program? Before you can use Flameshot, you have to review the configuration. This is not self-evident, and the whole work flow isn’t really intuitive. 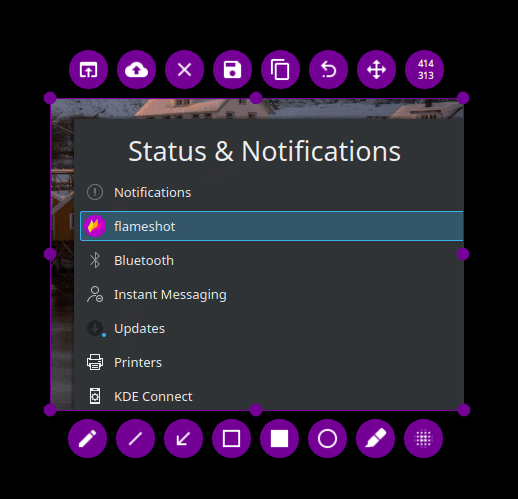 On the first tab, under Interface, you can tweak how Flameshot looks like when you work it (colors and opacity), although the user has not seen the program just yet, so this feels out of context. You can also choose the quick-action buttons to be displayed, and I have to say I didn’t understand this until I actually ran the program properly the first time. The Filename Editor tab is also a little confusing. Plus, this is a required step, so unless you do this, you won’t be saving any screenshots, so you do need to populate the edit field. Now, from what I figured here, this also implies an automatic save option, which I wasn’t looking for. I wanted something that I could use interactively and give meaningful, human-readable names like desktop-live.jpeg or distro-applications.png or similar. Not necessarily exclusively, but as an option. 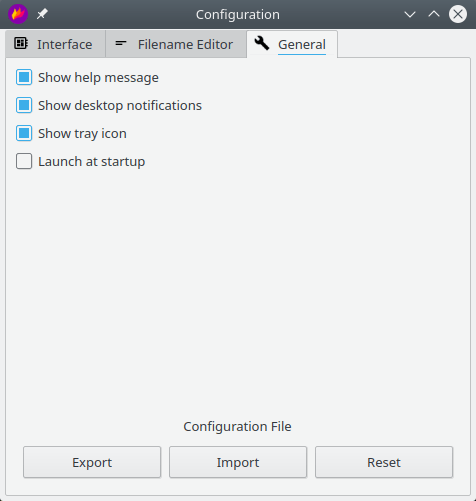 The last tab – General – is mostly around help messages, notifications and system tray icon. But then, what happens if you don’t use the system tray icon, does that mean you need to invoke the program from the menu every single time, and how do the last two options work together if the selection is reversed, i.e. no icon but the program is launched at startup. Does that mean it’s running as a background service or such? Once I realized what to do next, I began using Flameshot – and hit a bunch of fresh hurdles. The program has a rich command-line interface, but you don’t get that if you use it from the system menu. Like having a delay option. Nope. So screenshots were always immediate, and they always included either the menu or the system area, because I was using those to start Flameshot. 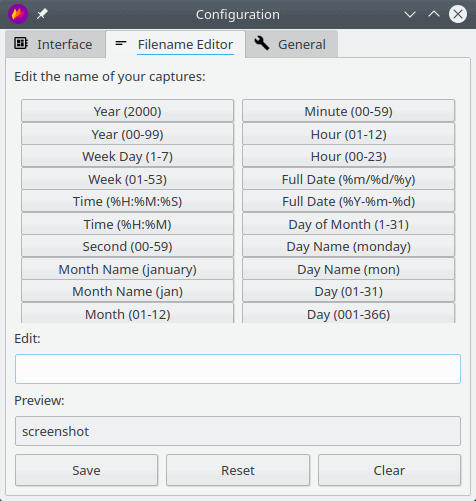 With Gnome screenshot or Spectacle, the program UI is hidden, so you get cleaner images. here, it was an all or nothing situation. 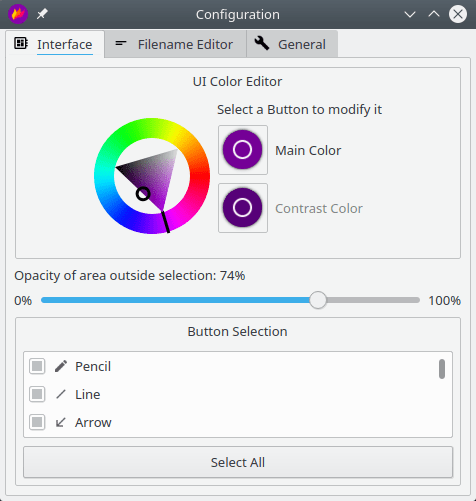 Then, you drag to select a rectangle, and then you get a UI of symbolic buttons – the color and selection thereof having been configured earlier. I was confused, because the buttons have no hover text, plus they shift around the rectangular selection based on its size. If some buttons do not fit on one side, they will move up and down and whatnot. This means you can’t memorize the interface. I don’t know what’s outside the rectangle, and it makes me feel oddly claustrophobic. And here, the interface has changed, with the buttons moving about, and the system tray is showing up as I invoked the program from there, and there’s no option to interact with the desktop in this mode. I also didn’t like having to work with selection from a black screen – you basically don’t see the desktop, rather than have it the other way around. Very odd. It also meant I was wasting time trying to create a clean setup for screenshots rather than just taking them and naming them. I soon discovered an even bigger problem. A showstopper really – I apologize for using this corporate word, it will not happen again. Indeed, Flameshot does not have an option to actually capture the active window, which is something I require the most. When you have a dozen windows open on your desktop, you want to be able to capture only one active application and not all the rest. You can’t do that with Flameshot, which makes it completely useless for me. Shortcuts also didn’t work for me – there are some fancy ones, but you need to integrate them into the desktop manually. From the command line, things were looking a little better, but again, I was not looking for an automated tool that can be scripted – that’s the easy part – but something interactive and elegant that will give me all the flexibility I need without any hard-imposed selections – like shadows, or in this case, names or the full-screen capture. Another confusing thing that happened was – after I did capture a screenshot or two, a UI would pop asking me if I wanted to open the images in other programs, offering a rather eclectic range of applications. Now, what would be the point of that if I’ve just done all the necessary processing and post-processing using the built-in Flameshot tools? If I need to use another program, I might as well use that all the way. I honestly don’t understand what happened here. I have to say I’m completely baffled by Flameshot and its logic. 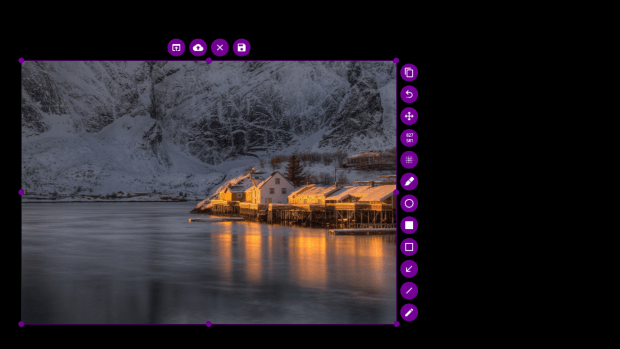 This could be a really nice program for when creating tutorials, and you want to make image annotations, but not if you just want to capture images of your work progress, with a fully interactive interface. There isn’t one, and the convoluted way in how the program is configured, launched and then used really makes it harder than it should be. The big issue is the lack of the ability to screenshot individual application windows – or other desktops, if you have more than one workspace. This is something that Spectacle does well, for instance. If I have to manually clean up my desktop so that only one window is showing up, and then capture it by dragging a rectangle around its shape – when it’s already a self-defined UI entity – then it’s a big waste of effort, and completely misses the point. All in all, Flameshot isn’t for me. Not in its current guise. If it had a UI – which it does in a way – where I could manually and fully choose what to do, and be able to access the options and tweaks and everything, with a full 1:1 mapping between command line and graphical interface, then this could be the killer app I’ve been looking for all these years. At the moment, this ain’t the case, by a big margin, the search for the unicorn continues, and I will have to eke by with a less-than-perfect screenshot program solution. Maybe one day. Take care. ← Boxes for your Tuxes – Worth it? Well, for my day to day use (sales and software dev.) I use exclusively flameshot I have never required active window, because what I want to shot is always active and I do not need it all – just part of it. Gnome shot is very inconvenient, especially because you can not fine tune border, the shutter takes an eternity to load with all it’s unnecessary-for-me plugins. The flameshot is fast, easy to highlight, easy to share, to save. For 10 years working on Linux I could not not find better tool for me.